I’ve just been invited to make a presentation on Weather Bomb 1913: Life and Death on the Great Lakes at the 2018 Canadian Nautical Research Society’s conference which will be held June 21-23 at York University in Toronto. The presentations will be live streamed for interested parties who cannot attend in person. More details will be available in the next few weeks, but please plan on joining us either in person or online. In an age of radar, electronic communications and constant marine forecasts with updates, she sank, with no SOS, leaving hardly a trace. After the enquiry by the U.S. Coast Guard and National Transportation Safety Board, it appeared that the sinking was probably caused by cargo hatches that gave way, which led to the holds flooding. 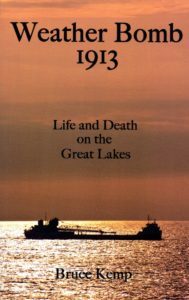 Much less is known by Canadians of the huge disaster on the Great Lakes in November 1913 when over 290 sailors lost their lives. Thanks to the extraordinary research of respected author Bruce Kemp, we now have a picture of what may be the greatest storm known on the Lakes. The opening chapters are presented in a “you-are there” style that brings to life the characters on the Lakes, their courage and faults. This is followed by analysis of the weather, the ship sinkings, the lack of sufficient navigation aids to assist safe seamanship and the quality of design and construction in that era, for example, poorly secured wooden hatches that blew away in the unprecedented storm. This is a good read, and while lacking some charts or photos from Canadian and U.S. sources that would have helped the narrative, the book is a valuable history of the dangers of a perfect storm in 1913, one which may recur as strange global weather patterns become the norm. As we sit at home in Ontario’s rather dismal November/December weather, this valuable, well researched, descriptive book allows us to conclude, in 2017, that we are really quite snug (smug?) and comfortable.